Yesterday’s Mazzoleni Songmasters concert featured mezzo Lucia Cervoni, tenor Michael Colvin and pianist Rachel Andrist in a varied programme of song. It kicked off with two songs by George MacNutt; Take Me to a Green Isle, sung by Michael, and O Love, Be Deep, sung by Lucia. Both songs are in a quite meditative mood and served to give us a pretty good idea of what we could expect later on. Michael sings very much in the British manner, which comes as no surprise with his extensive work at ENO and the number of Britten roles he sings. Lucia’s dark, smokey mezzo sounded rather more operatic. Damiano Michieletto’s production of Rossini’s Guillaume Tell at the Royal Opera House in 2015 was controversial because of the replacement of the Act 3 scene where Austrian soldiers force Swiss girls to dance with them with something far more explicit. It is a tough scene to watch but it’s absolutely consistent with a very thoughtful overall approach to the piece. After all what do occupying troops do with village girls? The director, rightly I think, sees the piece as being about the brutality of military occupation and colonialism but also recognises that the Tell legend, especially in its Schiller version is overlaid with euphemising Romanticism. Michieletto’s production both strips away and draws attention to the Romanticisation. He sets the piece in a roughly contemporary setting. To me, the civilians look 1950s but Gesler’s men look more modern. The actual action is played out unsentimentally, indeed brutally, in this time period. The ballets, one of the principal euphemising agents, are all replaced by more realistic action. To draw attention to how the legend has been transmitted two devices are introduced. Tell’s son Jemmy has a comic book version of Schiller which he consults at key points and there’s a silent character; medieval Tell, straight out of the legend with feathered cap etc who appears whenever the morale of actual Tell or the Swiss in general needs a boost. It sounds a bit corny but it really does the job. So here is the promised review of last night at the Four Seasons Centre. I have to phrase it that way because it was more than Somers’ opera Louis Riel though that of course was the major event. The evening kicked off with a performance in the RBA by the Git Hayetsk Dance Group. This is a west coast group and I’m not going to try and get into the complexities of nation, lineage and clan involved but it was a moving performance of traditional songs and dance with a brilliantly witty piece involving the trickster raven and a lot of stolen handbags. This was also the beginning of the public conversation about the use of the Nsga’a mourning song in Louis Riel. That conversation continued when the same group made a brief appearance on the main stage immediately before the opera performance. I understand that the intent is for the leader of the dancers to report back to the matriarch of the clan that owns the song on what happened and for the conversation to continue from there. 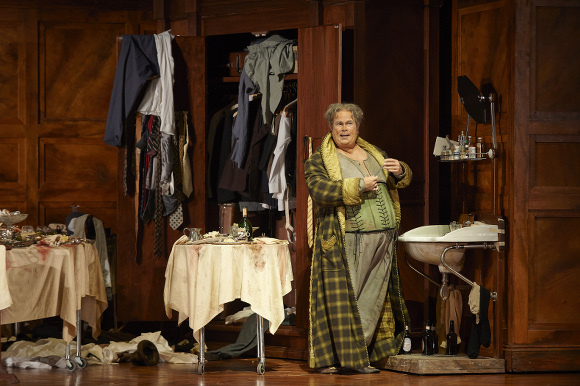 Claus Guth’s production of Mozart’s Le Nozze di Figaro, first seen at Salzburg in 2006, opened last night at the COC. I was curious to see how it would be received because, while by no means an extreme production by European standards, it’s well beyond the 1970s aesthetic beloved by sections of the Toronto audience. The aesthetic is Northern European; a Strindberg play or a Bergmann film perhaps. It’s monochromatic, quite slow and focusses on the darker side of the characters’ psyches. It’s the antithesis of Figaro as Feydeau farce. There’s also a non-canonical character, Cherubim. He’s a winged doppelganger of Cherubino and seems to be a cross between Cupid and Puck. Pretty much omnipresent he manipulates scenes and characters though with a power that falls well short of absolute. Perhaps the whole production is best summed up in the final ensemble. Cherubim visits each couple in turn and is brusquely rejected. Only Cherubino is still subject to his power and that seems to have become destructive. Perhaps the message is “Now we are married forget this love nonsense and let us get back to our drab lives of quiet despair”. Last night, the COC opened its 2014/15 season with Verdi’s Falstaff; a work I was not familiar with and one that turned out to be a bit of a surprise. It’s not your usual Verdi. It’s his last opera, composed when he was 80, and is not at all typical of his earlier work. There are hardly any “big tunes” or even conventional arias. The odd chorus harks back to an earlier style but much of the music is quite dark; heavy use in places of the lower pitched instruments, especially for a “comedy”. Don’t take that as a criticism though. It’s a musically and dramatically tight, even compact, work that is both incredibly funny and also something more disturbing. Perhaps it’s as much about mortality as love. The last of this season’s Recitals at Rosedale was on the theme of the the Seven Deadly Sins. It was an interesting and enjoyable afternoon, perhaps notable as much for what it had to say about the state of the industry as for the music making. The format was four singers moving fairly rapidly between short (more the most part) songs linked by a one or two sentence chosen text. The effect was to keep things moving along swiftly and even to generate a kind of narrative arc. There was no time for applause between numbers for example. It was a very different feel from the traditional art song recital where one or two singers sing sets of related songs. It was also quite operatic. All the singers chose to act physically and with the voice. Again, a far cry from the art song tradition where a raised eyebrow is considered over acting. Overall I thought it worked and in a city where the music commentariat has been lamenting the death of the art song recital for years somebody has to try something! 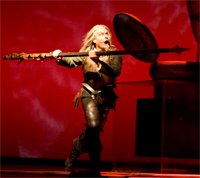 Friday, May 8 sees the opening of Massenet’s Don Quichotte at the COC. It’s strongly cast with Ferruccio Furlanetto, Quinn Kelsey and Anita Rachvelishvili headlining. There are seven performances between Friday and May 24.